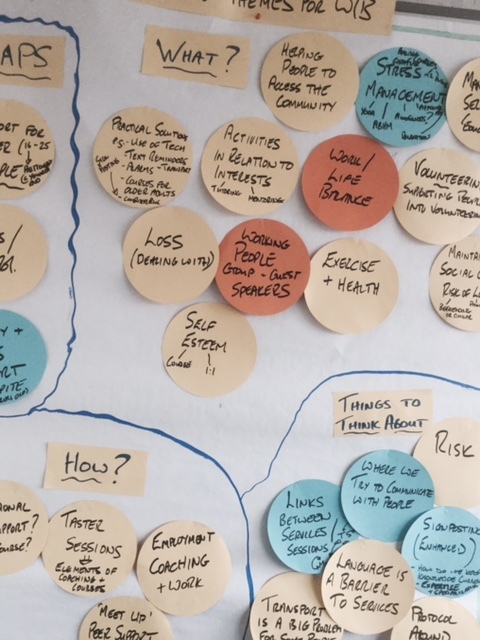 In the third of Rob's blog posts about supporting an organisation through a period of cultural change, he talks about his involvement in redesigning their services in a way that integrates person-centred approaches. I’ve recently been able to work with an established Mental Health service provider to begin to redesign part of their service delivery. The situation in which the provider found itself is not unusual. Services had been developed over a number of years and were delivered very effectively and to a high standard. A couple of years ago the service was re-commissioned with a different specification, but after success in the inevitably stressful tender process, everyone had breathed a sigh of relief and not much had changed about service delivery on the ground. As a result, problems were being found in reporting, commissioners were querying the value of the service and there was a tension between the existing service model, which was highly effective for the people who accessed the service, but not achieving the reach required by the contract. One of the difficulties in managing change in this situation is that staff are (understandably) not keen to change something they know is working well for the people who use their service. It is far harder to focus on the needs of people who may wish to use your service than on those who actually do, so a certain amount of defensiveness is natural. This presents a management challenge, as the need for change is easily interpreted as criticism of current ways of working, and by implication, of the staff delivering the service. I realised that I needed a way to make the needs of the wider population more real to the staff team and to help them to take a broader view of their work. My solution to this problem was to develop a new way of using one of our core person-centred tools, the One-Page Profile. Taking inspiration from the TLAP Care and Support Planning Tool which I had the chance to work on in 2015, I created 6 fictional One-Page Profiles, each profile describing someone who fitted into the whole population the service was commissioned to support, in this case people with Mild and Moderate Mental Health needs. Each profile was developed to be representative of real need in the community and also to challenge existing service delivery to some extent. This challenges included people who did not live where services were provided, those who had caring responsibilities which prevented accessing services at the times they were offered, people with limited English language/literacy, or where there was a particular priority for the person which the organisation was not currently set up to meet. Note: A first point to make is that I am fully aware of the gaping hole in this process, in that there is no direct involvement of people using services. The reason for this is that the organisation I was working with does not (yet) have a sufficiently developed means of consulting with people who use services, particularly with those who are not currently accessing services. This is acknowledged as a weakness within the organisation and improvements are being personally led by the new Chief Executive. Creating the profiles was a time consuming task. I was keen to make sure I was not ‘loading’ the profiles so that the staff felt railroaded into making pre-determined choices. I needed to make sure that the existing service provision was still suitable for some of the fictional characters, otherwise we could have ended up with something completely undeliverable. Once the profiles had been completed, proof read and printed, the complete set were sent to all the locality team managers, who would begin to look a the profiles with their teams. I had decided at a very early stage that this was such a fundamental piece of work that we had to go for maximum consultation and give all staff a chance to contribute. A focus group approach simply wasn’t going to cut it. Staff teams looked at the One-Page Profiles in detail in their team meetings, then each team’s input was brought by representatives of each team to a workshop a few weeks later. 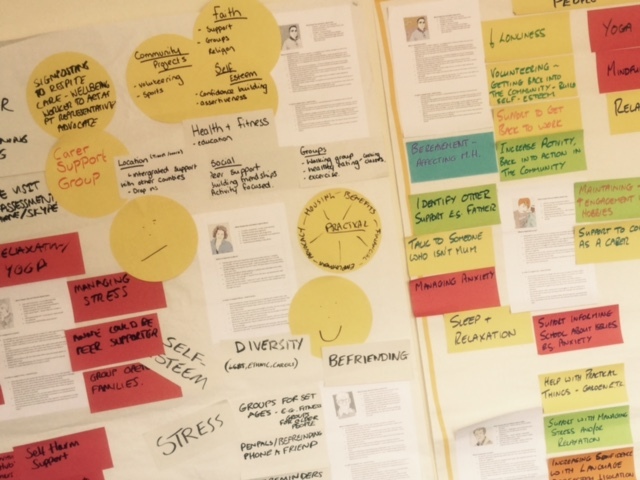 In this workshop, we collated all the work, identified common themes and then prioritised these themes, giving us the foundations for changes to services. What were the advantages of using this approach? It felt new – primarily because it was! I’m not sure if One-Page Profiles have been used in this way before, but it certainly hadn’t been done with this provider. Staff were generally interested in trying something new and different. Everyone was able to have an input. As mentioned in yesterday’s blog, the organisation had struggled recently in terms of its culture. The perception on the ground was that staff were not involved in decision making, so an overt attempt to involve as many people as possible was vital in terms of trust, as well as the best option in terms of making the right decisions. Staff will have ownership of the new service model rather than having it imposed on them, and even if some are still not happy, there can be no complaints regarding involvement. We could involve (and impress) commissioners. Through being able to explain the process we were using and get input into the development of the One-Page Profiles we could show that we were taking concerns and queries seriously and also demonstrate a creative approach to making changes. The people we are trying to support come first at all times. By basing everything around the needs of individual people (fictional, but based on real examples) we can have a discussion about how best to support the individual, rather than based on how best to fulfil a contract. If you are thinking of trying this sort of approach, these are a few things to bear in mind. Spend LOTS of time on the profiles – effort really shows in fictional profiles, just like it does with the real thing! Tell everyone what you are doing and why. Don’t just turn up at a staff meeting and expect people to be creative on the spot. I’m not a great fan of attempting to be mysterious – full disclosure is the way to go. I changed the One-Page Profile format ever so slightly, using ‘In order to support (name) you need to know’ instead of ‘How best to support me’. I did this to incorporate elements which might normally be found on someone’s risk assessment and care plan, which were the documents staff were used to referring to when looking at a person’s needs. Facilitating this sort of process can be tricky – be really clear on what you are trying to achieve and keep returning to that to check your progress. Designing services with One Page Profiles is not a perfect method – for that you’d want far more involvement from people who use services and a process like Working Together For Change can give you that. But as a means to get started, if you don’t have the underpinning structures necessary for a WTFC process, it worked really well. I’d be delighted to hear how anyone else has used One-Page Profiles, or any other person-centred thinking tools in new or unusual ways. If you’d like to feed back on this blog, please join us on our Facebook page or leave a comment below.